In modern “free,” Western “democracies,” one may defame the Pope, the prophet Mohammed, or even God Him/Herself, smearing and slurring anyone’s “sacred cows” (Hindus’ obviously included) with impunity, but the “Holocaust” — holy, sacred, transcendent — is beyond public reproach. Consider that in at least seven Western countries a critic can be fined and jailed for “denying” or even “trivializing” the Holocaust, that event of Jewish obsession that has usurped what was once known as World War II, a pan-human disaster from which as many as 64 million people may have died. There is an old adage to understand this phenomenon of the holocaustal pedestal in Western life: one may gauge true power in any culture by what is forbidden to be publicly spoken. 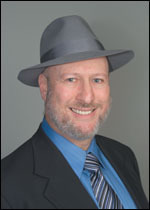 Which brings us to Rabbi Daniel Lapin. Quite a milestone occurred on the pages of the Internet the other day. Rabbi Daniel Lapin, an Orthodox Jew, declared that Hitler was right. At least about one thing: that highly visible Jews were in the vanguard of cultural decadence in pre-Nazi Germany. In other words, Lapin dares to infer that which cannot be publicly spoken: Jewish responsibility — at least partially — for soliciting hostile German feelings that led to the Holocaust. And attendant Jewish blame. As we all know, particularly in “free” Western democracies, no one is allowed to speak like this. Even agreeing with Hitler that the sky is blue engenders considerable political and personal risk. Hitler and the Nazis are held to be an airtight ideological package — a kind of vacuum cleaner. If one dares to suggest that not everything Hitler said about Jews was maliciously invented, that — in today’s Judeocentric dictate — brands the offender as a certifiable “Nazi” whose latent aim must be to murder Jewry. Well, surprise. 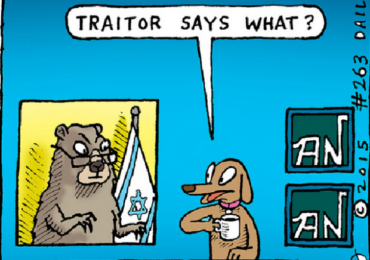 Rabbi Lapin has broken all the rules. And for a Jew to admit that Hitler’s disdain for Jews had a reasoned basis in pre-Nazi German culture, as Lapin explicitly does, is truly revolutionary. He poses a small ray of light in a very dark chamber, a light that can reveal clearly and honestly the moral and rational roots of Gentile (and Jewish!) “anti-Semitism” throughout the Jewish story. Lapin cites Mein Kampf (which is banned in some countries today) to illustrate the parallels between Jewish prominence in the destruction of traditional German values and to underscore similar Jewish erosion of its American counterpart today. Agreeing with Hitler about anything is one of the foremost taboos in Western culture. Brutal, ruthless Adolf Hitler is the completely dehumanized icon for Evil: he is an amalgamation of the Devil, Darth Vadar, Tolkien’s Dark Lord, Headless Horsemen, Zombie Death Machines, and bloodthirsty Martians from Outer Space. And within this heavy matrix, the gravity of Jewish suffering under the Nazis effectively screens inquirers from investigating the enduringly delicate “whys” of the way so much of Europe turned on the Torah’s favored tribe. The frozen monolith of Jewish Good versus Anti-Semitic Evil is held to be polar, dualistic, dialectical: the Dark Lord enacts his bloody role in history from one side and completely Innocent Jewry fulfills their martyrological destiny on the other (although this has changed with nuclear bomb-laden Israel), with no middle ground or factual shades of any sort allowed. Rabbi Lapin was careful to delineate — as well he should — the difference between what Hitler said and what he did. As much as Jewish convention dictates otherwise, decrying Jewish behavior and herding them into ovens aren’t synonymous. Nor is there logical closure between open critique in 2005 and the peculiar contexts of World War II. The “Holocaust” occurred in the very heart of a very vicious war and, as a reminder, the Second World War did not center around the singular issue of Jewish survival problems in battlefield countries where anyone stood to be decimated. Rabbi Lapin is obviously a very unusual man, let alone an unusual Jew. You won’t find any other Jews (or anyone else in “respectable” public discourse) quoting Hitler to make a point these days. And, truth be told, only a Jew has the remotest chance of getting away with it. One would imagine that Jews at large would be eager to understand the social, political, and psychological currents that gave rise to violent political action against them. You’d think they would want to remedy the problem of anti-Jewish hostility, once and for all. Once truly understood, one might logically presume that what Jews call “anti-Semitism” could be finally eliminated — by negotiation, frank exchange, sharing of grievances, and building mutual good faith between Jews and Gentiles. But of course the Jewish community as an organized group isn’t really interested in understanding “anti-Semitism.” On the contrary. It merely condemns and forbids it and that is all. In this regard, modern Jewry is obsessed with spirited censorship and myth-making towards the central premises of Darwinian self-survival or, much more correctly, tribal survival. The key to understanding Jewish identity in 2005 is the Holocaust and Israel. 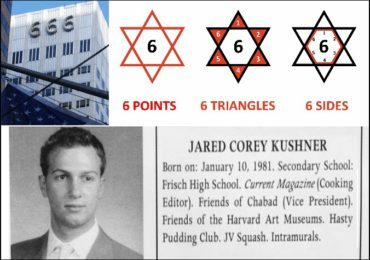 Religious, racial, and ethnic Jewish identities morph and unmorph, overlap and underlap, but when the dust always settles it is Jewish fears of the omnipresent ‘anti-Semitic” boogeyman that represents the pillar of Jewish self-conception. And in the hidden Jewish torture chambers lies the heart of modern Jewish being: the military garrison state of Israel, sworn to the sword to protect the world’s diverse “stiff-necked” tribe — whoever they are, whatever they’ve done, to the very last man or woman. Herein lies the pulse of today’s Jewish morality: corruption, deviance, exploitation, deception — anything to protect the Tribe. Universalistic moral precepts take second rung to the hysterically defensive Judeocentric injunction to defend the Tribe from all and any attack, large, small, or marginally perceptible. This includes the regular censorial exercise of smothering the smallest “anti-Semitic” kindling, lest it broaden its fire of complaint. Enter Rabbi Daniel Lapin with dire warnings for deaf Jewish ears. But not even Lapin (who ignores the unseemly premises of traditionally racist, segregationist Judaism as a self-defined Orthodox Jew) seems to understand the dire “evil” that weighs so heavily in the Jewish direction. The principle threat to Jewish survival is not a “second-coming” Holocaust, led by barbarous Jew-hating goyim, in physical form. It is courageous Jews like Rabbi Lapin himself, who may not grasp the totality of the problem at hand, but stands firmly, defiantly, along the right track (more or less), digging deeply for the moral threads of his identity. The greatest threat to collective Jewish survival comes not from Frankenstein-like “anti-Semites” and a world Islamic uprising. It comes from the potential “Holocaust” within the Jewish fortress line: the long, steady tradition of Jewish “self-hatred” (an in-house form of “anti-Semitism”) that has always paralleled — like a magnetic echo — Jewish self-obsession, self-delusion, and self-evasion. And this is what the formal Jewish community has always had to defend most robustly against. Why did Hitler turn so vehemently against Jews? Rabbi Lapin directs us towards an honest answer, towards honest understanding, towards a true reconciliation. Introductions to the broader problems of Jewish attitude and hegemony in Germany’s pre-Nazi Weimar Republic start below. Next Post Duke Speaks in Sweden! 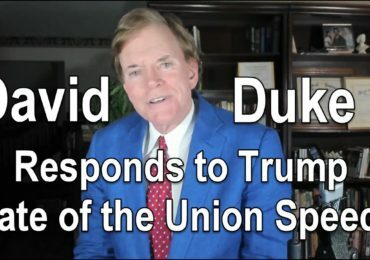 Dr. David Duke: No! I Did not Endorse Tulsi Gabbard for President.